I am on my own starting Wednesday for meals this week, which means I get to try new things that my fiance wouldn’t touch! While he will be in Vegas, I will be enjoying veggies 🙂 and organizing. Is that strange that these are the things I choose to do when I am on my own? Hmm. Sunday: Corn and Bacon Chowder – this was very yummy, I also added a few more veggies than it called for and the bacon is very little that is crumbled on top. Wednesday: Vegetable Soup (I made on Sunday night with my veggies that weren’t going to make it through the week. I will freeze the rest and bring to work for lunches. It smells really yummy!) This was a really easy recipe: 1 quart of chicken stock, 1 cup of whole wheat pasta, any combination of veggies (I used zucchini, onion, carrots and spinach), season to taste. This is going to be my go to recipe to try to save more veggies. 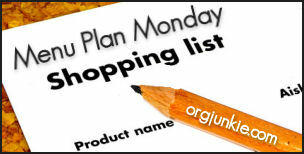 Sorry, I have not been posting my Menu Plan Monday posts! Now that I have moved and all of my kitchen is unpacked, I am ready to start planning again. I have been working out in a boot camp class since August 2009 and I love it! I would highly recommend to anyone who needs the extra motivation to find a group exercise class or event! I keep going because I am paying for it and I could not be happier with the results! Included in this class is help with food choices, which I really need help with! Therefore, my meals are going to be geared towards making better food choices and incorporating healthy items into my week. Lunch – Leftovers from night before x 3. Turkey sandwich x 2. Snacks – carrots, celery and peanut butter, zucchini bread (homemade last night), apples, and nuts. I have a minimum of 1 snacks in between meals. 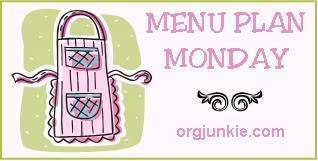 Wednesday – Dinner: Maple Glazed Salmon Filets with Asparagus and a Salad. Thursday – Egg scramble with spinach and veggies. January turned out to be a very cheap month since we tried to eat out of our pantry for the month! We will continue eating out of our pantry for the next two weeks while we are in the process of moving. Then I will have more time to be more creative in our meals and also work towards creating more healthy meals for less money. Friday: Dinner with my boyfriends family for his birthday. This week’s meals should be very easy because most are leftover from my freezer cooking a couple months ago. As I’ve mentioned before, we are making an effort to clean out our freezer and pantry this month and spend as little as possible on food this month. I hope everyone is having a great start to the holiday week! My menu plan is a little slim this week, since I will be at my parents house for Thanksgiving (I am hoping it will snow!). Sunday – Traveling all day.